My Grandma Grimshaw passed away a few years ago and I recently reached out to my aunt who has all of her belongings. I asked my aunt if my Grandma had any recipes because I watched my Grandma cook growing up. She said she has lots of recipe cards and cook books. She said I could have them and now I’m going to be sharing them with all of you. 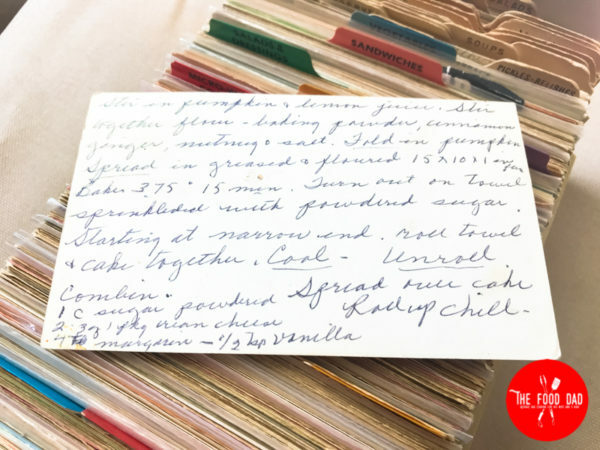 She had hundreds of recipe cards all hand written. Some are hard to read but I’m going to start making and post all the recipes. Combine 1 cup sugar powder, 6 oz cream cheese, 4 tbsp butter, and 1/2 tsp vanilla. Spread over cooled cake and then roll back up.